I love to bake with all sorts of flavors, but there are a select few that are always at the top of my list. Peanut butter is definitely one of those. I’ve used it in all sorts of recipes, and I am pretty much always trying to think of ways to use it even more. 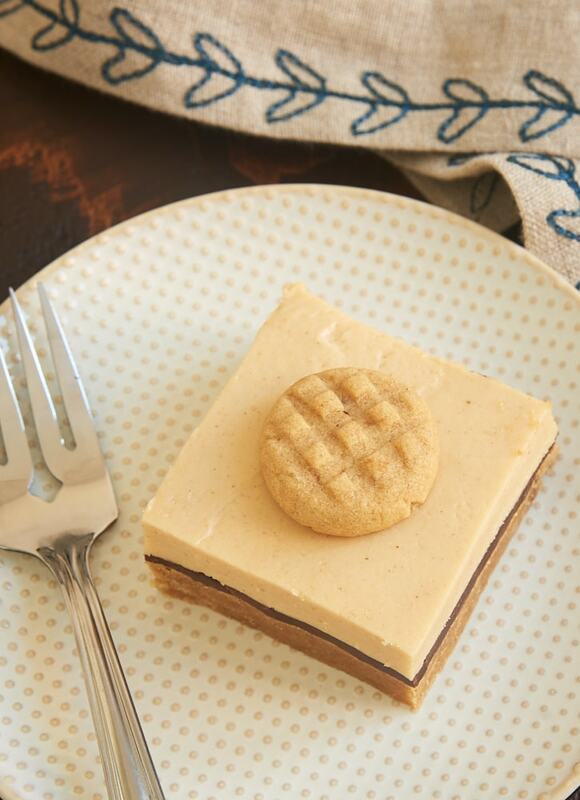 Once I realized that I’d never shared peanut butter cheesecake bars with you, I knew I had to remedy that quickly. The bottom layer of these bars is a variation of my go-to recipe for peanut butter cookies. Just spread the cookie dough in a pan and bake it. Simple as that! Next, I added a layer of chocolate. I can rarely resist adding some chocolate when peanut butter is involved. They just go together so well that I can’t help myself. 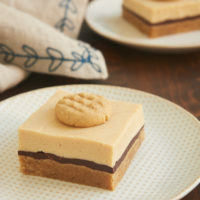 But if you want to make an all-out peanut butter dessert, just omit the chocolate layer. 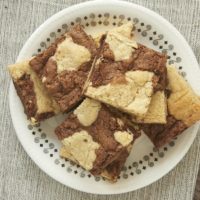 A while back, I saw a recipe that used a cookie crust with crumbled cookies on top for garnish. I can’t for the life of me remember where that was, but I remember thinking that I wanted to try that sometime. Instead of using cookie crumbs, I baked some mini peanut butter cookies and placed them on the cheesecake bars. I have to say that they’re quite adorable. They’re so tiny! 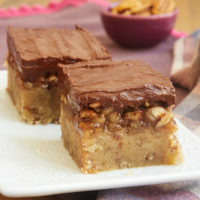 If you love chocolate and peanut butter like I do, then you’ll love these bars. 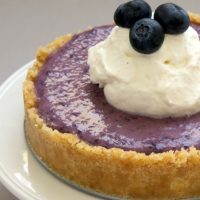 The cool, creamy texture of the cheesecake is the perfect match to the cookie crust. And, of course, a little chocolate always helps. 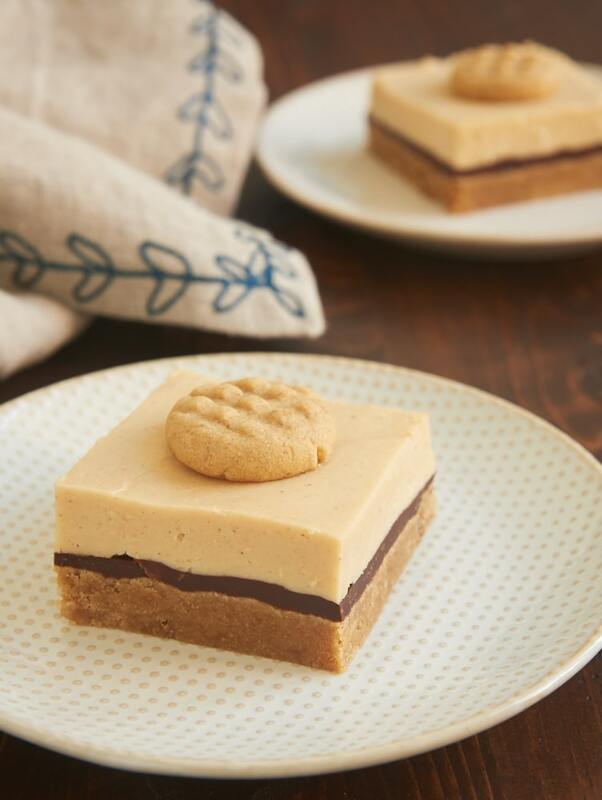 A peanut butter cookie crust, a no-bake peanut butter cheesecake filling, and a little bit of chocolate make these Peanut Butter Cheesecake Bars a cool, creamy favorite! Preheat oven to 350°F. Grease a 9″x 13″x 2″ baking pan. Line a baking sheet with parchment paper or a silicone liner. 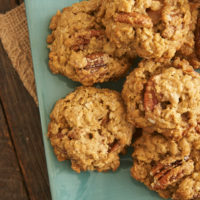 Using an electric mixer on medium speed, beat the peanut butter, butter, sugar, and brown sugar until light and fluffy. Add the egg and vanilla, and mix well. Scoop 24 teaspoon portions of the dough. Roll each into a ball, and place on the prepared baking sheet. Use a fork to make a cross-hatch pattern on top of each cookie. Bake 6 to 8 minutes, or until light browned. Cool on the pan for 5 minutes. Then transfer the cookies to a wire rack to cool completely. Spread the remaining cookie dough evenly in the bottom of the prepared rectangular pan. Bake 18 to 22 minutes, or until lightly browned. Set aside to cool. Place the chocolate and butter in a microwave-safe bowl. Heat in the microwave at half-power until the butter has melted and the chocolate melts when stirred. Stir until smooth. Spread the chocolate mixture evenly over the crust. Place the pan in the refrigerator until the chocolate has set (about 30 minutes). Using an electric mixer on medium speed, beat the cream cheese, peanut butter, and sugar until thoroughly combined and smooth. In a separate bowl, use an electric mixer with a whisk attachment to whip the cream until soft peaks form. Gently fold the whipped cream into the cream cheese mixture. Spread the filling on top of the cooled chocolate layer. Refrigerate at least 4 hours. 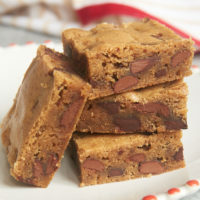 Place a cookie on top of each bar when serving. Wow looks awesome! Love peanut butter (I couldn’t stand it until last year…) but it’s so expensive here in Italy, damn!! Omg those little pb cookies are too precious! 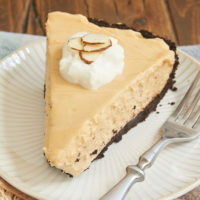 I love that idea 🙂 Love the combo of cookie crust + creamy cheesecake!